We provide official VIN Check & PPSR certificates with registration details, finance owing, stolen vehicle data & write-off history. So, you're looking to buy a used car and you’ve found one you like. But do you know all the details about that particular car? And how can you trust that the information you get is accurate? We’ve all heard the horror stories of the lemons some people end up buying, and how it’s often too late for them to do anything about it. Don’t let this be you! Find out where that vehicle has been with a fast, reliable rms VIN number check from Quick Revs! Quick Revs is the easy-to-use, affordable platform to get a quick, detailed report on the history of any car registered in Australia, including in Queensland, Western Australia, Victoria, and New South Wales. Check a VIN number today with Quick Revs! A Quick Revs VIN Number Check gives you all the information you need to make the best sale or purchase of a used vehicle. Know the car you’re buying before you put your money on the table. You can instantly validate the car you would like to purchase with a Quick Revs vehicle history report. It’s a simple and easy process to do a VIN recal number lookup and find out the history of the vehicle. With Quick Revs car history reports, you get information on liens, theft reports, accidents – the entire history of the vehicle you want to buy. Verify the real information on the vehicle against what the seller tells you. Each PPSR Search result comes with Government Official PPSR Ceritificate. Are you a private seller or used car dealer and want to sell your car quickly? Offer your buyers a comprehensive VIN Check report! When you give your buyers a vehicle history report, you’re showing that you value their interests by providing professional service. With our affordable VIN search, you’ll have an organized report ready to convince your buyer of the great deal you’re offering. Check a VIN number now! When you check a VIN number with Quick Revs, you get verified and reliable information from government sources. Our checks and reports are based on official details compiled by the National Exchange of Vehicle and Driver Information System (NEVDIS) and the Australian Financial Security Authority (AFSA). Our VIN search history checks are presented in an easy-to-read, well-formatted report, outlining vehicle history, finance checks, (encumbrances), write-offs, theft status and registration details.Also we offer vicroads vin check, rta vin check. Quick Revs takes your information security very seriously. Your PayPal, credit card and transaction information is kept safe through our secure payment system, and we don’t share or sell any of your information for any reason, unless required by law. Quick Revs is available and accessible 24/7, making it easy for you to get the details you need to help you avoid buying a lemon. Check a VIN number today! It is our mission to provide a fast, easy, safe platform for you to get the reliable information you need to make the best purchase decision for you and your family. We know you have a choice when it comes to your cheap VIN check service, and that’s why we offer the fastest, safest and most affordable service available, using data based on verifiable resources from NEVDIS and AFSA. Check a VIN number today with Quick Revs! What is VIN Number Check? VIN number check, also known as vehicle history report, VIN lookup, or Car VIN history check, is an online search that gives you all the details on a used vehicle. Quick Revs offers the fastest, safest and most affordable search available. VIN stands for Vehicle Identification Number, and every vehicle has a unique VIN. They are required by law, and every VIN is registered with the authorities. The VIN is a unique 17-character alpha-numeric code, and you can use it to find out all the critical information regarding the vehicle's history. What do the VIN numbers mean? The VIN Number can be found in one of two places on a vehicle: the bottom corner of the windshield on the driver's side, or on the inside door frame on the front driver's side. If you don't have the vehicle in front of you, you can find the number on the title, registration and insurance policy. How does VIN number check at Quick Revs work? All you have to do is insert the 17-character alpha-numeric code into the box provided and click "Get Report." You’ll be taken to an easy-to-use payment form where we accept PayPal or credit card. The report will then be compiled and delivered to you via your preferred method—phone notification or email. VIN Check NSW is easy with Quick Revs. If you live in New South Wales, or you want to buy a vehicle from a seller in New South Wales, we can help. Check VIN numbers for vehicles in NSW by simply filling in the form and paying a small fee. Does Quick Revs offer VIN Number Check VIC? Yes, you can run a VIN check VIC with Quick Revs. Our reports cover vehicles registered in Victoria and we have helped buyers and sellers across the Province get the information they need on their used vehicles. Can I do VIN number check WA? No need to worry about unscrupulous sellers with vehicles registered in Western Australia. 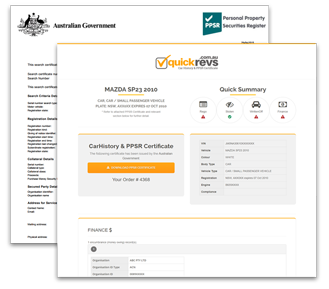 Quick Revs reports can help you with a VIN check WA for all used vehicles registered in the state. How to run a VIN number check Australia? It's very easy to run a VIN Number Check for vehicles throughout Australia. Just put in the VIN number and hit "Check." Our VIN Check Australia reports can also give you information on a vehicle registered in WA, QLD and VIC.